Things have never been easy for Quartz. Derided at one time as Sabbath clones for their closeness in both sound, location and relationships to the Earth-born rockers, they signed to Jet records (pretty much the equivalent of banging a nail into the lid of your own coffin), and have been bracketed in with the NWOBHM even though they released their first album in 1977 and their origins lie in the ridiculously-named Bandylegs formed in 1973. Still, it was 1980’s ‘Live Quartz’ album and co-support slot on Gillan’s ‘Glory Road’ tour that gave them light to shine, and despite a couple of dodgy skeletons in their back catalogue ‘Fear No Evil’ – their first full length studio release since 1983’s ‘Against All Odds’ – is a stonkingly good album. 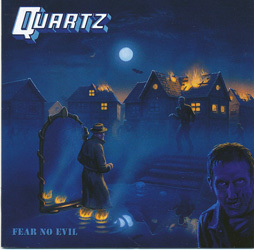 Featuring four-fifths of the band’s original line-up (with Geoff Nichols, Mick Hopkins, Derek Arnold and Malcolm Cope being joined by relative newbie David Garner on vocals), Quartz have been actively raising their profile recently and have come up with an album that burns with youthful flair and longevity while never straying too far from the band’s deeply-embedded roots. Given the way the songs are written and performed with riffs as thick as a builder’s biceps driving things along and giving way to swerveball time-changes and top-drawer solos the Sabbath comparisons are still quite valid, but what’s the harm in that? Lyrically on the surface at least it’s as NWOBHM as they come, all death ‘n’ doom and if a young lady puts in an appearance she’s generally the Devil’s daughter but again, so what? Will ‘Fear No Evil’ change the world? No. Is it entertaining? Yes, it most certainly is, and cute little tricks like name-checking Sabbath titles and lyrics (and even their own ‘Satan’s Serenade’) in the chugging ‘Zombie Resurrection’ also play their part. Most of the material is presumably recently penned, although ‘Born To Rock The Nation’ – one of the album’s many highlights – made an appearance originally on the 1996 ‘Resurrection’ set cobbled together and issued by Neat Metal in 1996. ‘Walking On Holy Water’ – a slow, doomy ballad – and the rebellious ‘Riot In The City’ are worth the price of the album alone, and ‘Scream At The Devil’ is a fun stomp to wrap the album up with. The only real grumbles are that a couple of the songs have let their influences betray them, with ‘Dead Man’s World’ sharing DNA with ‘Enter Sandman’ and ‘Rock Bottom’ being a tad too close to ‘Long Live Rock ‘N’ Roll’ for comfort. These are minor gripes though and in no way spoil what is a masterly comeback.